The markets are unpredictable, but watching key variables such as price trends and earnings expectations can be very effective in order to make data-driven investment decisions. Rising stock prices attract more buyers and vice versa. Stock prices and earnings expectations tend to move in the same direction over tome. Following price trends and earnings expectations can be a great strategy to reduce downside risk and increase return over the long term. The strategy is not infallible, but investment decisions supported by objective data are superior to those based purely on opinions and speculation. Trying to time the market is generally a losing proposition. However, the statistical evidence shows that following key indicators such as price trends and earnings expectations can be remarkably effective when it comes to evaluating the market environment and positioning your portfolio accordingly. The following article is introducing a quantitative strategy that intends to reduce downside risk in SPDR S&P 500 (SPY) by following two main factors: price trends and earnings expectations for companies in the S&P 500 index. The strategy holds positions over the long term, and it does not trade very often. Importantly, it does not require any kind of prediction about the future, all that is required is looking at price trends and earnings expectations at a particular point in time. The system is obviously not perfect or infallible, but it does a great job in terms of increasing returns and controlling downside risk in tough market environments. Momentum is a pervasive force in the stock market, meaning that rising prices attract more buyers and falling prices generate more selling pressure. One of the simplest ways to optimize investment results is by following the price trends over the long term. There are all kinds of trend indicators to consider but, as Da Vinci said, "simplicity is the ultimate sophistication". The 200-day moving average in prices does a solid job in terms of identifying the main direction in the trend, so it can be an effective and straightforward indicator to watch. The quantitative system takes a look at the slope of the 200-day moving average in SPDR S&P 500, and it buys the ETF when such a slope is positive in the past ten days. The risk-off signal is triggered when the slope of the 200-day moving average is declining over the past 10 days. However, the strategy combines both price momentum and fundamental momentum before making any decisions. The stock market is a forward-looking mechanism, and investors expectations can have a big impact on stock prices. When earnings expectations are increasing, chances are that stock prices will be moving in the right direction and vice-versa. Since earnings expectations can have too much volatility, the strategy smoothes the data by comparing the 5 days moving average versus the 21 days moving average in earnings expectations for companies in the S&P 500. When the 5-day moving average is above the 21-day moving average, this means that earnings expectations are increasing. The quantitative strategy will be long the SPDR S&P 500 if one of the two signals is indicating a long position, meaning when either price momentum is positive or earnings momentum is positive. If both price and earnings are positive, the system is obviously long too. In other words, the quantitative strategy will only go to cash when both market prices and earnings expectations are moving downward. The main idea behind this double-signal requirement is trying to avoid false signals as much as possible. Sometimes market prices can go down because of short-term volatility or some kind of economic scare. But as long as earnings are moving in the right direction, chances are that such a market dip will ultimately be a buying opportunity. That is why observing earnings trends when prices are declining can be remarkably important. The same goes for earnings expectations. Sometimes earnings are declining because of temporary factors affecting the economy or due to weakness concentrated in a single sector. If this happens, the probabilities are that stocks will still continue doing well in spite of the decline in earnings expectations. By looking at both earnings and price trends at the same time, we can try to avoid going to cash in situations in which one of those indicators is providing a false signal. We can still get false signals when using two indicators, but the signals are generally more reliable when using two as opposed to one indicator. The following backtest is long the SPDR S&P 500 and it goes to cash when both prices are in a downtrend and earnings expectations are declining. The portfolio is rebalanced every 4 weeks, so portfolio turnover is pretty low. Trading expenses are assumed to be 0.2% per transaction. Since January of 1999 the strategy produced a total cumulative return of 468.86% versus 239.96% for a buy and hold position in SPDR S&P 500 over the same period. This means that a $100,000 investment in the quantitative strategy in January of 1999 would currently be worth $568,900, and the same amount of capital in a buy and hold position in SPDR S&P 500 would be worth 340,000. The strategy alpha amounts to 4.2% per year. Not only return is superior, but the maximum drawdown - meaning the maximum capital loss from the peak - is 28% for the quantitative system versus a much larger 55.42% for SPDR S&P 500 over the backtesting period. The strategy substantially outperforms versus buy and hold over the long term. However, this is mostly because the backtesting period includes two deep bear markets in 2001 and 2008. 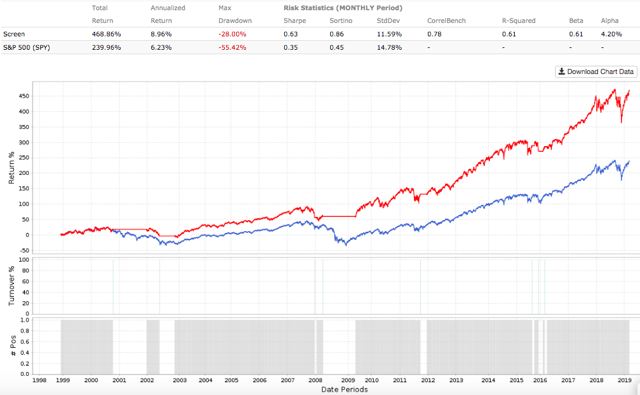 If we look solely at returns in the past 5 years, the strategy gained 64.31% versus 70.94% for SPDR S&P 500. The strategy went to cash for a few months in 2016, since that was ultimately a shallow pullback, this move had a negative impact on returns for the quantitative strategy. That is just an unavoidable disadvantage in these kinds of strategies. Even if we include different indicators to try to avoid false signals as much as possible, from time to time you can still get a false signal. We can think of this problem as the cost that you need to pay for portfolio protection. If you want to protect your capital in a difficult market environment, then you need to be willing to assume to the risk of selling too early during a shallow market pullback. There is no guarantee that a strategy such as this one will deliver higher returns versus buy and hold, especially in short periods of time. But the main strength in these strategies is that they provide capital protection when stocks are going through severe bear markets, which is a major consideration to many investors. An interesting possibility is applying leverage to the portfolio in order to increase returns. 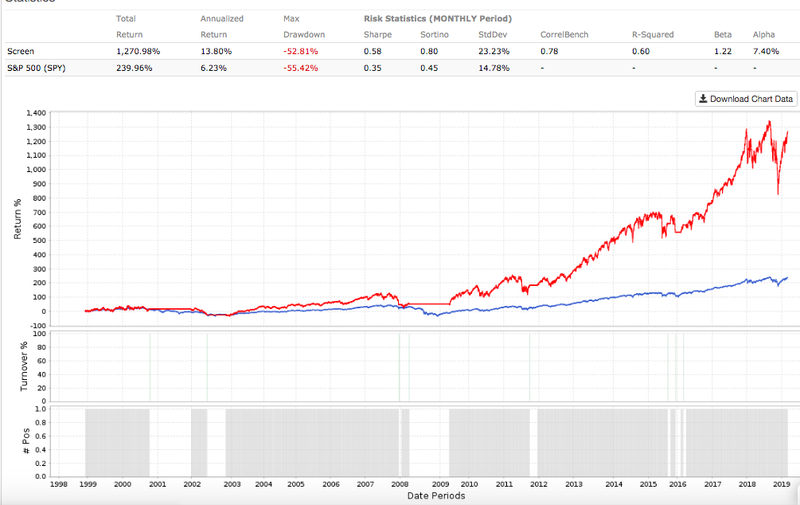 The following backtest follows the exact same rules as the strategy above, but it buys the double-leveraged ProShares Ultra S&P 500 (SSO) as opposed to SPDR S&P 500. The data is quite interesting. Cumulative return for the leveraged strategy stands at 1,270.98% versus 239.96% for a buy and hold investment in SPDR S&P 500. The strategy alpha is 7.4% per year. To put the numbers in perspective, a $100,000 investment in the leveraged strategy in January of 1999 would currently be worth $1.37 million, and the same capital invested in a buy and hold position in SPDR S&P 500 would be worth only $340,000. Looking at the risks, the maximum drawdown is 52.81% for the quantitative strategy versus 55.42% for buy and hold investors in SPDR S&P 500 over the backtesting period. This means that the quantitative strategy far surpassed by and hold in terms of total return, and it did so with a marginally smaller level of risk. If we look at returns over the past five years, the strategy gained 128.59% versus 70.94% for SPDR S&P 500. Even if the strategy still went to cash for a few months during 2016, the fact that ProShares Ultra S&P 500 is a leveraged instrument allowed the quantitative system to substantially outperform. 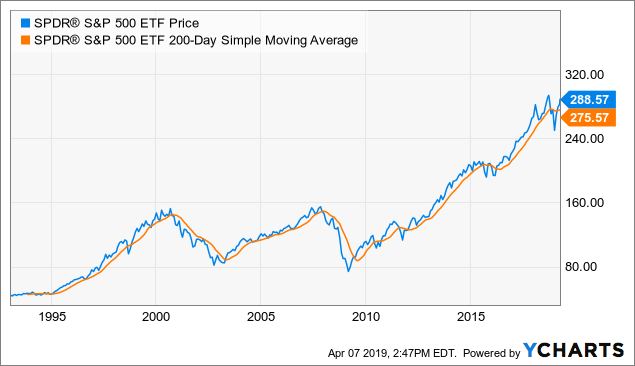 This strategy focused on price trends and earnings expectations does a great job of protecting the portfolio from massive drawdowns in 2001 and 2008. In 2011 and 2016, however, the strategy provided some false signals, but the overall impact on returns was still moderate. In any case, investors who are particularly concerned about leaving some gains on the table can consider the possibility of applying leverage to the portfolio to increase returns, since leverage can more than compensate for the negative impact of false signals on returns. Markets are unpredictable, but looking at key variables such as price trends and earnings expectations can be a smart strategy to make data-driven investment decisions and optimize the risk and reward equation in your portfolio. Statistical research has proven that stocks and ETFs showing certain quantitative attributes tend to outperform the market over the long term. A subscription to The Data Driven Investor provides you access to profitable screeners and live portfolios based on these effective and time-proven return drivers. Forget about opinions and speculation, investing decisions based on cold hard quantitative data can provide you superior returns with lower risk. Click here to get your free trial now.